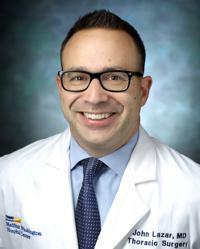 John F. Lazar, MD, is a board-certified general thoracic surgeon, Director of Thoracic Robotics at Medstar Washington Hospital Center, and an assistant professor of thoracic surgery at Georgetown University in Washington, DC. He is a member of the Society of Thoracic Surgeons, the Society of Robotic Surgery, and serves on the executive board of both the Eastern Cardiothoracic Surgical Society and the American Lung Association. As a general thoracic surgeon, Dr. Lazar specializes in the treatment of malignant and benign diseases of the lung, the esophagus, the mediastinum, the trachea, and the bony structures of the chest wall. Dr. Lazar uses laparoscopic, video-assisted thoracoscopic surgery (VATS), robotic, and open surgical techniques for the treatment of thoracic conditions. Some of the surgeries he performs are robotic esophagectomy, mediastinal resections, hiatal hernia repair, tracheal repair and resection, and complex robotic lung preserving resections. In addition, Dr. Lazar and his team are one of the only teams in the world that robotically treat tracheobronchial malacia, a condition that causes difficulty breathing due to airway collapse. Dr. Lazar’s clinical interests include treating benign and malignant diseases of the esophagus, lung cancer prevention, and the use of advanced robotic surgical techniques in the chest. His professional interests have focused on the development of new technologies for robotic surgery, understanding and alleviating healthcare disparity, and applying multidisciplinary approaches to improve long-term survival and quality of life for thoracic cancer patients. He is passionate about educating communities about the benefits of quitting smoking while giving them the tools necessary to quit, and educating them on the ways to get screened for lung cancer. One of Dr. Lazar’s major clinical interests is building Medstar into a regional epicenter for robotic surgery, with a comprehensive emphasis on the patient’s individual experience at the MedStar Washington Hospital Center. He and his team of surgeons are receiving referrals of patients with conditions of the thoracic region. Dr. Lazar received his medical degree from Saint George University School of Medicine and completed his general surgery training at UPMC/Pinnacle in Harrisburg, Pennsylvania. He went on to complete a two-year fellowship in thoracic surgery at the University of Rochester, a national leader in esophageal surgery and complex minimally invasive surgery. Anticipating the growing role of robotics in surgery, Dr. Lazar joined the Division of Thoracic Surgery at Lenox Hill Hospital in New York City as a fellow in minimally invasive thoracic surgery with a concentration in robotic surgery and thoracic oncology. As result of this training, he is one of the only dedicated fellowship trained thoracic robotic surgeons in the world. Subsequently, he returned to UPMC/PinnacleHealth in Pennsylvania, where he developed their Robotics Institute and expanded the program into the largest community based robotic programs in the state. Dr. Lazar has been the recipient of numerous awards, including the Intuitive Clinical Robotic Research Grant, which gave him the opportunity to explore the financial impact and clinical benefit of a community thoracic robotic program; the Thoracic Surgery Foundation for Research and Education Alley-Sheridan Scholarship; Pennsylvania Comprehensive Cancer Control Mini-Grant for smoking cessation in pregnant women; and First Place for best video presentation awarded by the International Society for Minimally Invasive Cardiothoracic Surgery at the annual meeting, where he presented a video presentation of robotically assisted bilateral bronchoplasty for tracheobronchial malacia. In addition, Dr. Lazar has presented his research at dozens of meetings across the country for international conferences and organizations. “As a careful, skilled, and well-trained surgeon, I treat each and every patient of mine as if they were a member of my family. To me, this means being transparent and communicating clearly.